Shorts in her usual size were way too small at H&M. What’s up with H&M’s sizing? That’s what Lottie L’Amour wanted to know when she posted a series of tweets about the retailer’s sizing scale. L’Amour, 31, a plus-size fashion blogger from London, described her frustrating recent trip to the fast-fashion store. She said she is typically at U.K. size 24, but she could not fit into any of the size 24 clothing at H&M. In fact, a pair of shorts that was supposedly a size 28 fit perfectly on her girlfriend — who is a U.K. size 16. She tweeted a photo of Emma trying on the shorts and pointed out their "size 28" label. LOOK AT THOSE SHORTS. Size 28 clothing tight on a size 16 woman. How the hell are plus size people supposed to shop for clothes when this is the sizing options? @hm just throw the whole plus size range away. It’s not fit for purpose. “I usually expect to size up or down at other stores depending on how their garments fit and what fabrics they use, but it's never as bad as this,” L’Amour told TODAY Style in an email. She said that H&M’s non-industry-standard sizing makes it difficult for plus-sized customers to find items that fit. “I'm not personally worried by what a label says, but when a size disparity means that I can't physically buy from a range that is supposed to be for my size, it's more a matter of being unable to buy clothing, despite technically being catered for,” she wrote. And while L'Amour said she has learned not to define her worth by “numbers on a bit of fabric,” she worries that the skewed sizing could have a negative effect on shoppers struggling with serious body-image issues. “Not only is it potentially dangerous for sizing to be so far out for young people who suffer with body dysmorphia or eating disorders because of how climbing up several sizes will affect their self-esteem, but it's also really damaging for plus-size customers who are automatically sized out of a range that is meant to be for them,” she told TODAY. L’Amour’s tweets struck a nerve on Twitter, and many women responded with their own frustration over H&M’s non-standard sizing. I have legit sobbed recently because of of H&M+ clothin where I'd already bought the largest size n couldn't get it on, I was sat in a heap just giving myself grief! It's awful and that's comin from someone who's a little bit more confident than the average plus woman! H&M hugely values all customer feedback. It is only ever our intention to design and make clothes that make our customers feel good about themselves. Our sizes are continually reviewed by our in-house sizing department and this is an on-going process. H&M also recently announced that they are in the process of updating their women’s sizing guidelines in the U.S., the U.K., Canada and other locations, to bring their sizing structure “more in line with the U.S. size standard and with the retail marketplace,” a company spokesperson told TODAY Style in an email. They are essentially shifting sizes one down, so that if a shopper was previously a size 14, she would be a size 12 under the new guidelines. 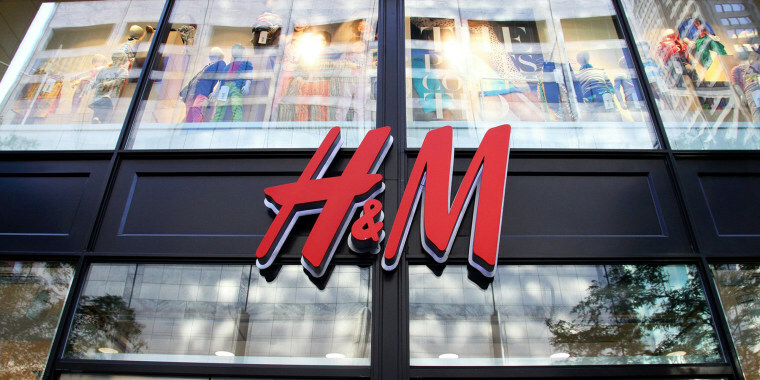 Some of the old sizes may still be on the racks as individual stores transition to the new sizing system, the H&M representative told TODAY. L’Amour is aware of H&M’s updated sizing policy but says it is not enough. She claims it's "just making a cosmetic change to their sizing by moving their sizes up one based on their current sizing." She added that until the company makes some fundamental changes to their sizing structure, she won’t be shopping at the store anytime soon.